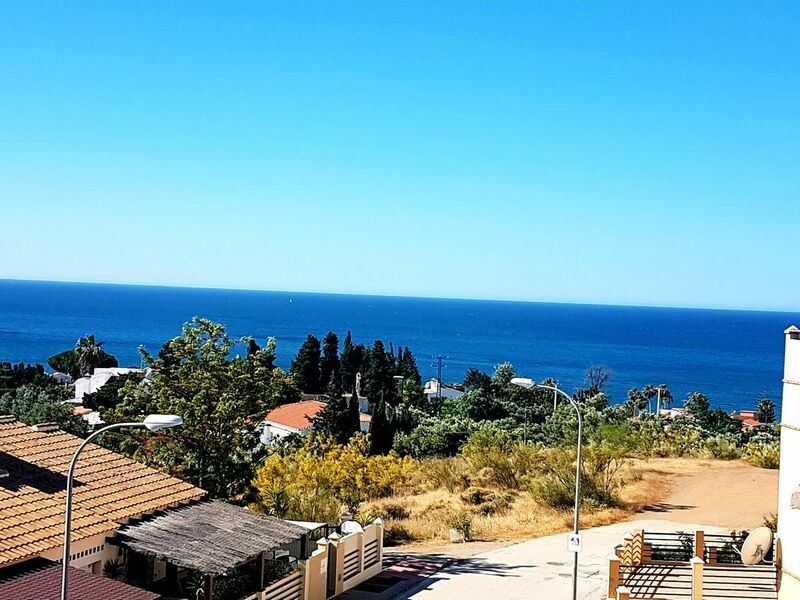 Terraced house with 3 bedrooms, sea views, 700 meters from the beach. Beautiful semi-detached villa with stunning views to the Mediterranean Sea in a very safe residential area. Cozy housing with modern decoration that has, among other comforts, a large terrace, patio, free Wi-Fi in all rooms and communal swimming pool at guests' disposal. Located 700m from the beach and surrounded by all kinds of services: supermarkets, restaurants, pharmacy, golf club, etc. Just 20 km from the center of Málaga and 35 km from the airport. The accommodation consists of 3 bedrooms with A / C and attic, two bathrooms, a toilet, living room, large kitchen. All the rooms of the house are spacious and bright and are fully furnished and equipped. Quiet coastal area with not crowded beaches and typical chiringuitos in which to taste the good fried fish of Malaga and other local gastronomic specialties. In the exterior of the house is a large terrace with unbeatable sea views and a large backyard with barbecue that has awning and outdoor eating / dining area. The three bedrooms and the attic are exterior. The attic has an additional terrace that is used as a solarium. Although it is not essential, the use of a private car is recommended for the convenience of the renter. Just 600 meters from the house there are bus stops that connect with Malaga and Nerja respectively. The frequency of these buses is every approximately 20 minutes. The price of the round trip to Malaga is 3.01 euros (as of March 2017). The standard and specification of the property and amenities was even better than it looked ! My family loved this place and will be going again. Thank you very much, it has been a pleasure to have you as guests, we hope to see you soon in Malaga.